What is it and why do you want it? Integral Color Concrete Curbing is beautiful, versatile and functional landscape edging. It does not shift, rot, fade, attract bugs or termites. It keeps mulch in, and grass out of your flower beds and planters. It is a continuous concrete border that gets extruded out of a specialty curbing machine, toweled to perfection, and sealed to protect from UV rays. Curb-Masters only uses integral color which means the color is throughout the entire concrete mix. Think of cake frosting with red food coloring mixed in. All of the frosting is red, not just the top. Other companies use a “pour over” color on top of gray cement. That means if you should scratch your curbing with a weed eater or mower, the gray concrete will show through. Curb-Masters also has the most variety available. Not only do we have the traditional “slant” and “mower’s edge” shapes available, we also have Belgian Block and Natural Stone to choose from. Your lawn will not look like everyone else’s! We have 31 standard colors to choose from along with 4 distinct textures and many stamped patterns to add if you want to spice it up. Start with a free design consultation at your home. We will be bring actual concrete curbing samples in different colors and patterns for you to see, touch, and put down where your curbing will actually be placed. You will know exactly how the curbing will look with your home and landscape before purchase. 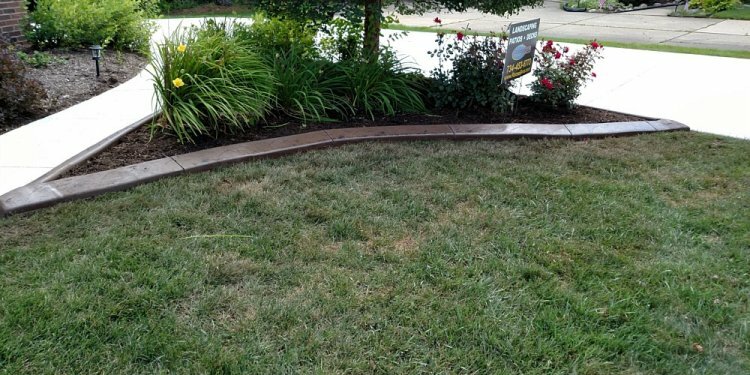 Once you have chosen the curbing placement, our crew will mark the design and prep the area. Curb-Masters uses a specialized curbing bed-edger that makes a smooth 9 inch wide path that your curbing will be installed on. Your concrete curbing color will be custom mixed on site the day of installation. Curb-Masters uses only the best quality integral color, sand, fiber mesh, color additive, and Portland cement available to insure lasting, even color and strong crack-resistant curbing. Curb-Masters curbing machine extrudes a continuous piece of concrete curbing right onto the prepared pathway. The curbing is then hand troweled to a smooth finish, textured and stamped to perfection. Control joints or expansion joints are cut into the finished concrete about every 4 feet to further guard against cracking due to movement or shifts in the earth. Your new landscape curbing will be sealed with a UV protective sealant to keep the color beautiful. Curb-Masters LLC also offers at an additional cost of .25 per foot a high grade, high gloss finish. Curb-Masters LLC also offers a high grade, high gloss sealer that can be applied when your curbing has completely cured. Before our crew leaves your home, your landscaping will be clean and more beautiful than it has ever been. We will go over the care and maintenance of your new landscape curbing and then leave you to enjoy the beauty, practicality, and durability of your new decorative concrete curbing for years to come.